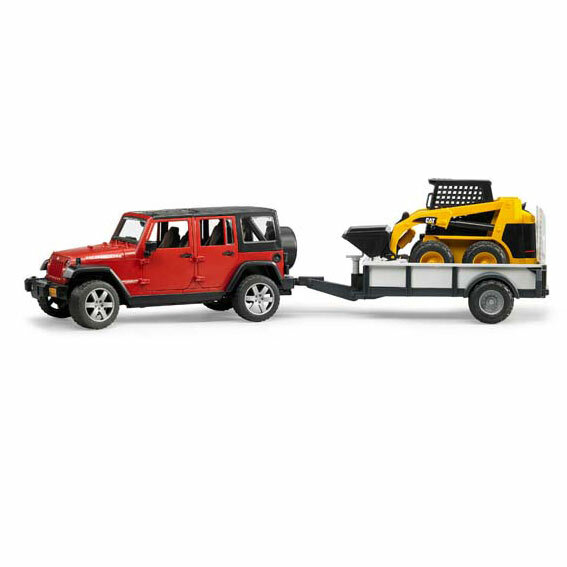 This 1:16 scale Jeep Wrangler Unlimited Rubicon, along with the Cat® Skid Steer Loader and Trailer, is an exact replica of the original. The Jeep not only looks like a stunning off-road vehicle, it also provides countless functions to enable almost unlimited fun and games. In addition to the two-part, detachable segment roof, the hood, rear door and all four side doors open. It almost goes without saying that the the vehicle provides enough space on the inside for four Bruder Bworld figures. Alternatively, the rear seat can be removed to create space for accessories compatible with Bruder standard connectors. The additional drag link is intended to facilitate steering through the roof hatch and, if it is not required, it can be stored in the vehicle underbody. The axles feature typical off-road vehicle suspension and tread tires with wheels in appealing SUV design. The front interface allows enhancements, such as the optionally available cable winch. The single-axle, bumper hitch trailer is equipped with a tool box and easy loading ramps, so it's always ready to take the Cat® Skid Steer Loader to any location. The loader features fully functional bood arms, with a detachable bucket, and treaded ribber tires.